Apterae, ± 2 mm long, solitary or in small groups at the underside of the leaves; the are not attended by ants. 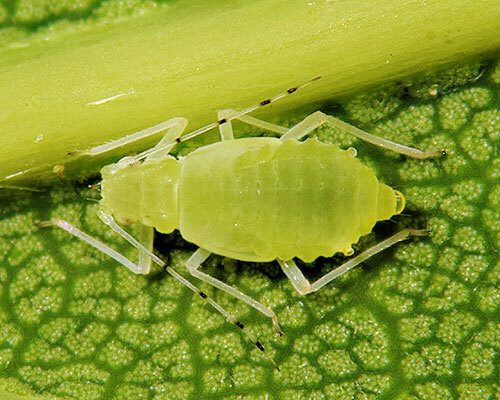 In Central Europe the commonest oak aphid. Quercus cerris, x coutinhoi, faginea, petraea, pubescens, pyrenaica, robur, suber. Q. robur is the most important by far. Tuberculoides annulatus; Aphis, Callipterus, quercus Kaltenbach, 1843. Barbagallo & Pollini (2014a), Blackman & Eastop (2017), Börner & Franz (1956a), Durak, Durak & Borowiak-Sobkowiak (0000a), Heie (1982a), Houard (1908a), Lampert & Meier (2003a), López Rodríguez & Nieto Nafría (1983a), Mier Durante & Nieto Nafría (1981a, 1997a), Mier Durante, Seco Fernández & Nieto Nafría (1989a), Nieto Nafría & Mier Durante (1981a, 1998a), Osiadacz & Wojciechowski (2008a), Petrović (1998a), Ripka (2011a), Ripka, Reider & Szalay-Marzsó (1998a, Stroyan (1977a), Tambs-Lyche & Heie (1984a), Weis (1955a), Wieczorek & Kanturski (2011a), Wojciechowski, Depa, Halgoš ao (2016a).